Disneyland: the happiest place on earth? Maybe not right now. Health officials have now confirmed 67 cases of measles linked to visits to California’s Disneyland and Disney Adventure Park. The Centers for Disease Control believe that the virus was carried by a visitor exposed to it overseas and that it then spread rapidly among unvaccinated children. Measles is highly contagious, extremely unpleasant, and can lead to brain damage and even death. So please vaccinate your children – and maybe skip that trip to Disneyland this winter in favor of some fun at home with the cat. 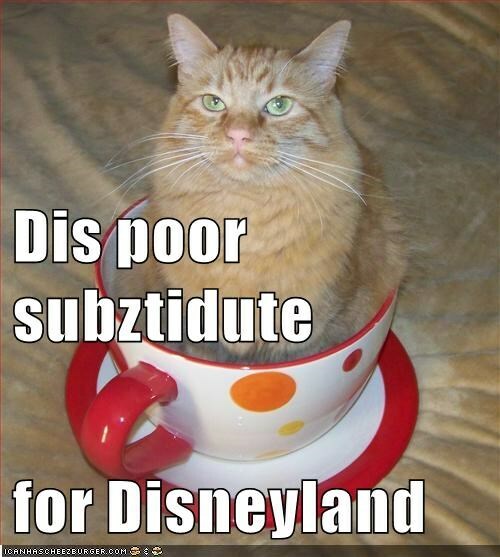 This entry was posted in Science Caturday and tagged disney cat, infectious disease cat, measles cat, measles lolcat. Bookmark the permalink.